A favorite subgenre of mine has always been the Christmas slasher flick. I’ve reveiwed a handful here at MCFTR over the years, starting with the cult classic Silent Night, Deadly Night several years ago and devoting practically the entire holiday season to the genre last year. 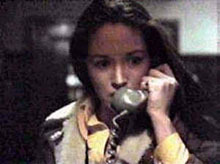 Generally, the movies you find involve killer Santas (or in the case of the Jack Frost movies, killer snowmen), but 1974’s Black Christmas, one of the first films of its kind, set a different pace. Romeo, Romeo, is that you making gurgling noises into the phone, Romeo? Nobody dons a Santa suit and slashes anyone up. In fact, you don’t really see anyone being slashed up. Seems kind of odd for a slasher film, until you realize how well-made this thing is. Black Christmas actually does something that most of today’s horror fans would not be able to comprehend: sets a mood and makes a truly scary movie experience. The film takes place primarily in a sorority house at a Canadian college. The girls are having their annual Christmas gathering before everyone goes home for the holidays. The party’s mood is shaken when the phone rings and the caller is making vile noises and describing lewd acts, before making some more serious threats. Soon after, the party disperses, and the house mother comes home. One of the sisters, Clare, heads upstairs to turn in, and meets her demise in the bedroom closet as the first victim of our movie’s killer. Her body is stashed in the attic of the house. The entire sorority goes home for Christmas break, with the exception of Barb (Margot Kidder), Phyllis (Andrea Martin), and Jessica (Olivia Hussey). Barb likes to get drunk, Phyllis is mousy and shy, and Jessica spends her time with musician boyfriend Peter. When Clare’s father shows up to take her home, they all realize that their sister is missing. The police are called to investigate the disappearance, but they don’t seem too concerned about it until a little girl’s body is found in a local park. Jessica reveals to Peter that she’s pregnant and is planning to have an abortion, but Peter is infuriated at the idea. He demands that they keep the baby and get married, but she’s not ready for that. Meanwhile, the phone calls continue, and all signs begin to point to Peter being the suspect. Before long, Jessica’s friends have also fallen victim to the killer and she finds herself all alone in the house. Peter is stalking around the outside, and everything looks bleak. Will she be able to survive? I won’t spoil any more for you, because the ending is pretty darn cool. I will let you in on the fact that there is still some mystery as to who is really responsible for everything at the end. Yes, now that it’s over thirty years old, Black Christmas might look a little hokey. Still, for its time, it was a groundbreaking piece of cinema. Released around the same time as Tobe Hooper’s The Texas Chainsaw Massacre, both films are credited for creating the whole slasher film. Still, there’s very little that those films have in common: While TCM is loud and graphic, this film is far more spooky and subdued. Almost all the violence is implied, which only helps to enchance the mood. So not only is this the first Christmas slasher movie, it may also be the first slasher movie altogether. By watching this film, you can see where a lot of other horror movie directors found their muse. Everything from Friday the 13th to Halloween to Scream draws inspiration from Black Christmas. The performances are a big plus. Hussey, Kidder, and Martin all hold up different ends of the college girl spectrum, and Dullea oscillates between being sympathetic to psychotic with ease. The cast is fairly small, and due to that, the body count is far lower than you usually see in this type of movie. Still, the use of lighting, music, and the excellent performances make this film a horror classic. The first thing that probably catches your eye when you behold a copy of this movie is the man who brought it to the screen. You might have heard of director Bob Clark, because he’s a filmmaker with a bunch of familiar titles under his belt. He cut his teeth on a handful of horror movies in the early 1970’s, including this one. And while today he’s tainted by such films as Baby Geniuses (and its sequel), Clark is best remembered for a couple of classic comedies from the 1980’s, including Porky’s and A Christmas Story. Yes, the man responsible for creating the greatest Christmas film of all time is also responsible for popularizing one of my favorite subgenres. For those two facts alone, he’s forever forgiven for any mistakes from his later life. Margot Kidder always was the kiss of death for any pretensions a film might have of being tolerable. And from your review, this film never even approached the front door of tolerable to begin with.